I'll be back in the States for most of this week for Thanksgiving, so I'm taking a break from posting. I'll return around December 1. The Globe's Buzz is a good place to track what's going on. Lucchino mentioned Wilder's diverse baseball experiences and an encouraging track record in player development. Since his minor league playing career ended in 1989, Wilder has worked for the A's, Atlanta, Cubs, Brewers, and White Sox. Michael Hill, the Marlins' assistant GM, is also expected to be interviewed. 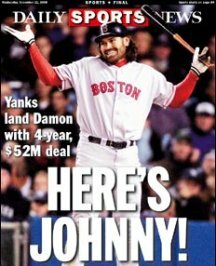 Bob Klapisch quotes a friend of Johnny Damon's: "Six months ago, there's no way Johnny would've even considered the Yankees. He's thinking about it now." This was the most difficult thing I've had to face. It really and truly came down to family considerations more than anything else. ... I felt extremely comfortable [at the Sox interview] and felt a lot of chemistry between Larry Lucchino, Tom Werner and myself. They were terrific to me and this could have been a great atmosphere for me, but the timing of this is such that I'm better off staying in Atlanta. The Red Sox will soon conduct second interviews with both Jim Beattie and Jim Bowden. ... Tony Massarotti says this whole situation is a mess. I definitely owe Boston a lot. People know who I am now. Despite putting up good numbers over the years before Boston, people now know about it. ... It's just a matter of us starting to talk about numbers. Damon is looking for something like 7/84 -- which is laughable, but, hey, I wish him well if he gets it. Boston apparently made an offer around 3/27, with (maybe) a fourth-year option or vesting option. They shouldn't go any higher or longer than that. I'd say 75 percent of the league uses amphetamines in some way, shape, or form. I'd say 40-45 percent use them regularly. Regularly means on a daily basis. 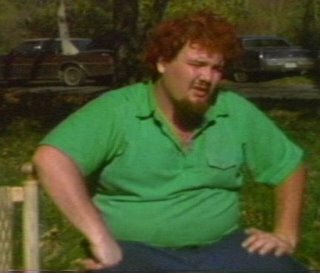 There are guys who can't play without amphetamines. I can't wait to see what happens. If you have guys using amphetamines for their entire minor league career, major league career, and relied on this for 12 years, boy, are you going to see some statistical changes. I really did vote on the basis that the Yankees won the division. I spoke to a number of pitchers and a lot of them told me that Ortiz was the one guy in the American League they wouldn't like to see up, over A-Rod, in a close and late situation. Over the course of the year, when the game was on the line in clutch situations, [Ortiz'] numbers were off the charts. As far as the DH rule goes, that's not his fault. If he was in the National League, he'd be playing first base and nobody would say anything. Boston added righthanded pitchers Jesus Delgado, Harvey Garcia, and David Pauley, lefthanded pitcher Jon Lester, and outfielders Brandon Moss and David Murphy to its 40-man roster. 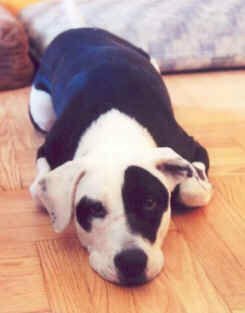 We will say goodbye to our Buster later this morning. Laura found him in mid-December 1999, abandoned in a pouring winter rain, very sick and likely only a day or two away from a lonely and horrible death on the street. It was a very tough decision, but we know it's the best thing we can do, for him, under the circumstances. So long, B ... Say hi to Gypsy and Clyde. One voter left Manny off his ballot completely. Go brew some coffee, this is a long one! The American League MVP -- David Ortiz or Alex Rodriguez -- will be announced on Monday. Either player would be a worthy selection, but who do I think should win? I should say right off that these awards are pretty much worthless since they have so often gone to the wrong player. The members of the BBWAA have next-to-zero credibility. My definition: "If I was putting together a team, what player would I choose first, based on his performance for the season in question?" Everybody's been talking to me about the MVP situation. As soon as they bring my name up, they always talk about, 'Oh, he's a DH. I don't think he deserves it because he's a DH.' You win the MVP because you help your ballclub, you win games whenever the team needs it and because you put up some numbers. Tony Massarotti (Herald) calls it "discrimination ... Since the creation of the position in 1973, the closest any DH has come to copping the MVP was in 1979, when California Angels slugger Don Baylor won the honor. Baylor played 97 games in the outfield and 65 as the DH ..."
I agree with Mazz. Should a DH be considered? Yes. I don't like the DH and wish baseball would get rid of it, but it is a valid position, just like shortstop, catcher, relief pitcher. And players at all of those positions have won MVP awards. ... Reliever Dennis Eckersley won the 1992 AL MVP when he pitched 80 innings. Rollie Fingers pitched only 78 innings when he won the AL MVP in 1981. Ortiz comes in fifth because he gains only .2 Win Shares from his fielding. However, the idea that he should be automatically removed from MVP consideration because he doesn't play defense is wrong. There must be a point at which his hitting compensates for his lack of defense. (Though some might say that not playing first benefits the Red Sox, allowing them to put a better-fielding player at the position.) The question is: Where it that point? RC (Runs Created): The number of runs a hitter contributes to his team (not adjusted for ballpark). RC/27: Runs Created per 27 outs; also the amount of runs that nine Ortizes (for example) would score against league-average pitching. BABIP: Batting Average on Balls put Into Play. EQA (Equivalent Average): A measure of total offensive value per out, adjusted for league offensive level, home park, and team pitching. EQA considers batting and baserunning, but not defense. VORP (Value Over Replacement Player): The number of runs contributed beyond what a replacement-level player at the same position would contribute if given the same percentage of team plate appearances. VORP does not consider the quality of a player's defense. Rodriguez is the clear winner here. ... And at that point, Yankees blogger Larry Mahnken writes that if Rodriguez is the superior offensive player, then the defense question is moot. Ortiz drove in 148 runs; Rodriguez brought in 130. But RBI is a highly-misleading stat, because a player's total depends on opportunity. If he hits a ton, but has no one on base, he won't get many RBI. So Baseball Prospectus presents RBI Opportunities (the number of runs a batter has driven in per runner on base. RBIs resulting from a batter driving himself in on home runs are not counted). In bringing home the bacon when there is bacon out there to be brought, Ortiz is much better than A-Rod. Blue Jay pitcher Josh Towers: "As good a hitter as he is, and he's one of the best, no question, I could never vote for a guy who doesn't play defense." Many people would agree. I would have given Ortiz more time at 1B this season (and less to Kevin Millar), but that's another story. The fact is: Ortiz did not play much in the field -- and Rodriguez is thought of as one of the best fielding third baseman in baseball. But is he? He is well below the average 3rd basemen in the league ... He's WORST in Range Factor for qualified AL starters, SECOND WORST in Zone Rating ... That is downright horrid. He is 9 runs worse then the average 3rd baseman. RF (Range Factor): The number of plays made per 9 innings. ZR (Zone Rating): The percentage of balls hit into the player's area that he turns into outs. FRAR (Fielding Runs Above Replacement): The difference between an average player and a replacement player is determined by the number of plays that position is called on to make. While the value at each position changes over time, the all-time adjustment for third base is 22. FRAA: Fielding Runs Above Average. Same idea as FRAR, but the fielder is compared to his peers. Rate: A way to look at the fielder's rate of production, equal to 100 plus the number of runs above or below average this fielder is per 100 games. (This is similar to ERA+ or OPS+.) A player with a rate of 110 is 10 runs above average per 100 games, a player with an 87 is 13 runs below average per 100 games, etc. Judging by these stats, Rodriguez was not a good third baseman in 2005 (regardless of the comparisons). In September, the media talked about how few errors he had made in the second half of the season, but with a poor Range Factor, he wasn't getting to tough balls on which he might have made errors. ... But was his hitting so much more productive than Ortiz's to overcome this deficiency (assuming Ortiz's defensive value was 0)? A-Rod has made play after play after play at third base down the stretch, and he's had an incredible offensive season. Ortiz has become the baseball equivalent of Joe Montana in big spots -- you know he's going to get a big hit. Ortiz is hitting about 60 points higher than his overall average with runners in scoring position, while A-Rod is hitting about 20 points lower than his overall average; he's not the most feared hitter in his own lineup. The Yankees win the division, so A-Rod gets the edge. New York was given the East title only because of necessary seeding for the playoffs. Both teams finished with identical records, but the Yankees went 10-9 against the Red Sox this year. For this discussion, looking at who won the East is meaningless. Say a tie-breaker had been played and the Red Sox won 1-0 on a non-Ortiz HR. Should Ortiz get the MVP because the Sox won the tie-breaker (and the East)? No. Ortiz, by the way, did everything in his power this weekend to wrap up what should be his rightful AL most valuable player trophy. No disrespect intended to the masterful season constructed by Alex Rodriguez, but given Ortiz's stunning array of clutch hits and his invaluable role to the psyche of this team, this is one of those very, very rare instances in which a designated hitter should win the award. This is an argument put forth by Ortiz's many supporters -- that he hits much better than Rodriguez when the game is on the line, when his production would be more valuable. This goes hand-in-hand with the perception (even among Yankees fans) that Rodriguez tends to perform better when the outcome of the game is not in doubt (such as hitting a two-run homer with his team ahead 10-1). good enough in the clutch. ... [T]he idea that Rodriguez doesn't come through often enough in big spots is a myth. ... Rodriguez is just as tough an out in a big spot as Ortiz -- actually, a little tougher if you read on-base percentage as the percentage of time the batter wins the war against the pitcher. The numbers do show that Ortiz is better at delivering the big blow -- the best in the game, in fact. But don't discount Rodriguez's work in key spots. Years ago, we wouldn't have had any idea if Verducci was right or wrong. Now we do. So, what is the truth? So Verducci, in citing Rodriguez's allegedly higher OBP in "big spots" (non-blowouts), is actually wrong. And in looking at "close and late" situations (below), we'll see that Verducci is wrong again. The "close and late" numbers are easily found. I guess that's why Verducci merely made a claim, rather than backing it up with any evidence. Because the evidence supporting his claim does not exist. Indeed, the evidence shows the opposite of his claim. Is there any question who the actual MVP is? How many of the Yankees' close losses would they have won if ARod had hit like Ortiz in them? How many of the Red Sox' close wins would they have lost if Ortiz had hit like ARod? Is the difference in defensive value that large? ... I'm amazed that people can still say "ARod had the better year at the plate" with a straight face, as if all situations were equal leverage and/or all differences in performance across leverage were random. An analysis by Win Expectancies shows Ortiz being massively more valuable. The splits by game result are a handy proxy for that, one that requires no explanation of an abstruse methodology. You could simulate the season in Diamond Mind from now until the death of the universe and not get that split. Still, the methodology isn't perfect. Using the final score is defining "clutch" retrospectively. Say A-Rod hits three-run home run breaking a 5-5 tie in the 8th; then the Yankees score three more in the 9th, winning 11-5. Although his hit was crucial, the game will be listed as a "non-clutch" game. Likewise, if Ortiz does nothing much as his teammates build a big lead, only to have it nearly blown by the bullpen, then that game suddenly becomes "clutch". Even if you calculated what the score/situation was in every single plate appearance, that still wouldn't clear things up. Because batting in a tie game is much different if it's 0-0 in the first inning or 4-4 in the eighth. A batter knows that in the first inning, he (and his team) will have plenty of time to score runs, and although it is a "tie game", there is less pressure. What a batter does in "close and late" situations can be known at the time they are occurring. Close & Late is defined as "in the 7th inning or later with the batting team either ahead by one run, tied or with the potential tying run at least on deck." There is also the issue of base-running. Rodriguez runs on the bases, Ortiz does not. Rodriguez stole 21 bases in 27 attempts (77.8%). A 75% success rate is considered the break-even point; below that, in general, you should not attempt to steal (game situations will vary, of course). ... Ortiz attempted one stolen base -- against Baltimore on July 10 -- and he was safe. 100%! If stats on taking an extra base (1st-to-3rd, 2nd-to-home) were readily available, Rodriguez would likely get an edge, but again, you would also have to know how many times he was thrown out in those attempts. So ... after all that, who is my AL MVP? Who is better when it comes to the "actual value of a player to his team ... the strength of offense and defense [as well as] general character, disposition, loyalty and effort"? ... Whose production would I take overall? I think it should be obvious there is no clear-cut answer (and I'm very curious how close the voting will be) (Over at the Courant, the Yankees writer picks Ortiz and the Red Sox writer tabs Rodriguez). I compiled a lot of these stats right after the season ended, and when I thought about refining this post, I kind of expected I'd pick Rodriguez in the end. But, assuming baserunning and fielding give neither player an edge (not provable, though), can Rodriguez's slightly-better numbers with the bat offset Ortiz's better numbers when his team needed his production the most? A loooooooong post on AL MVP coming soon. 1. I hate Roger Clemens. 2. He posted a 1.87 ERA this season. The NL average was 4.14. That means his ERA+ was 221 -- the second-best season of his career (he was slightly better (226) in 1997 (when he received 25 of 28 first-place votes). 3. Four BBWAA writers left him off their NL Cy Young ballots this year. Four! Although there are "persistent rumors" of Theo Epstein's return to the Red Sox, team chairman Tom Werner says the team has moved on: "We have read the rumors, and we completely discount them and are at a point where we turn the page." To that end, Nationals GM Jim Bowden was interviewed yesterday (for what he called his "dream job") and Jim Beattie will be interviewed today. Several current GMs -- Doug Melvin (Milwaukee), Kevin Towers (San Diego), Brian Sabean (San Francisco) and Terry Ryan (Minnesota) -- have taken themselves out of the running. Jim Duquette (Orioles VP of baseball operations) and David Forst (Athletics assistant general manager) both say they are not interested in the GM job. Two other possible candidates -- Cleveland assistant general manager Chris Antonetti and Tony LaCava, the Blue Jays' director of player personnel -- declined even to be interviewed. 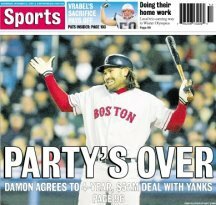 About ten days after Manny Ramirez made another demand to be traded, the Ramirez-to-Mets talk is once again alive. Ramirez's agent, Greg Genske, met on Wednesday with Werner and Larry Lucchino and both sides agreed to explore trade options. No mention was made of the alleged refusal of Manny to report to spring training if he is still a Red Sock. 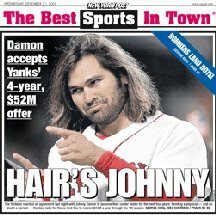 One major league executive told the New York Post: "To motivate the Red Sox to trade Manny is going to take more than just salary relief." Terry Francona will undergo surgery to replace his right knee. So who does the Baseball Writers Association of America decide was the best pitcher in the American League? Why, Bartolo Colon, of course. Colon's ERA+ was 120. And as far as not allowing runs -- pretty much a pitcher's top job, right? -- he was the third best starter on his own team. His 3.48 ERA was 8th best in the AL, behind Jarrod Washburn (4th, 3.20) and John Lackey (6th, 3.44). However, it isn't just the BBWAA who are morons. Colon was also named the top pitcher in all of MLB by The Sporting News and was chosen as the AL's outstanding pitcher in the Players Choice Awards. *: ERA+ is the ratio of the league's ERA (adjusted to the pitcher's ballpark) to that of the pitcher (lgERA / ERA). 100 is league average. The American League MVP Award will not be announced until November 14, but yesterday David Ortiz was voted the AL's Outstanding Player in the Players Choice Awards. Andruw Jones was named MLB Player of the Year. John Henry gave a long interview to radio station WEEI yesterday afternoon; many SoSHers, including Curt Schilling (comment numbers 188 and 227) offer their opinions. Theo Epstein's and John Henry's comments at yesterday's press conference (transcript here and Chris Snow's excellent overview here) brought up a lot of questions -- none of them larger than: Why? Why? Why? [I]n the end, this is a job you have to give your whole heart and soul to, you have to devote yourself to completely. You have to believe in every aspect of it. And in the end, after a long period of reflection about myself and the organization, and the time, I decided I could no longer put my whole heart and soul into it. Why? Why couldn't you no longer "give your whole heart and soul" to your job? What aspects of the job do you no longer believe in? What was it about the Red Sox organization that made you realize you had to leave? [Epstein] was asked [why] dozens of different ways yesterday ... He was clear -- indeed, expansive -- about all the things that weren't part of his decision to leave. But he never really articulated the things that were, other than to say, in various forms, what he said at the very beginning of the press conference. A lot of things happened during the end of this negotiation that caused me to think more closely about the situation, think about myself, think about the organization and whether it was the right fit. Again, in the end I decided that the right thing to do was to move on. It's possible that Epstein did not agree with the future direction -- regarding players, size of payroll, etc. -- that ownership wanted to take the team. Yesterday, the one question for which no answer was given was also the one which needed no answer: Why? Henry deferred to Epstein on the matter and Epstein danced like Fred Astaire, but deep in our hearts, we all know the truth. Epstein did not trust Lucchino. ... Why is [Lucchino] so difficult to trust? Lucchino's baseball career is spotted with fractured relationships, none more costly than this one. Epstein was his apprentice, his pupil, his understudy. In theory, no one should have trusted Lucchino more. In reality, no one seemed to trust him less. Lucchino was the one we wanted to hear, the one who might have been able to shed some light on how this ended up the way it did ... You would think he would have been there for no other reason than he's the public face of this franchise, its CEO. ... You would think he would have begun the first day of damage control, both to his image and the perception that the Red Sox are going to be fine, that the organization is strong enough to withstand the loss of anyone, Epstein included. I don't know how anyone can legitimately think the principal owner is not ultimately responsible for what happens with the general manager. How you can just give the principal owner of any baseball club a free pass? To lose Theo is a great loss. So I feel responsible. What could I have done? There's plenty I could have done. I have to ask myself maybe I'm not fit to be the principal owner of the Boston Red Sox. ... I had this romantic notion that Theo was going to be our general manager for the rest of my life. We had the best relationship imaginable. We still have the best relationship. I can't imagine having a better relationship with a human being than I have with Theo. So again: Why did things have to deteriorate to the point that Epstein felt he had to walk away? Snow writes that, according to a team source, "Henry's involvement extended only so far as remaining in close contact with Lucchino. Henry, according to the team source, made no real effort to involve himself in the negotiations until after Epstein's Monday afternoon resignation." What was Lucchino telling Henry about the progress of the negotiations? Why didn't Henry approach Epstein himself and get something done quickly last spring? Why wouldn't Henry have all three men sit down and talk? And when the talks dragged on this fall, why didn't Henry become more involved? ... Despite the non-answers and denials, the reasons for Theo's departure seem pretty clear. And Henry is siding with Lucchino on this one.